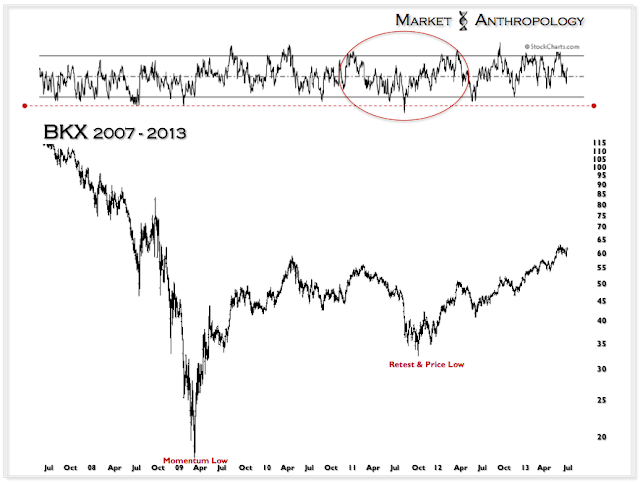 In a financial era defined by a more visible hand of the central banks, asset classes are bouncing with great frequency between the emotional poles of euphoria and gloom. As our work tends to focus on what lies ahead based on what has come before - the recent historical narrative has provided prescient context and analogy for previous asset movements echoing current market behaviors. From our perspective, climate change is here - and appears to have brought all the trauma and collateral damages we routinely find within our own backyards these days. 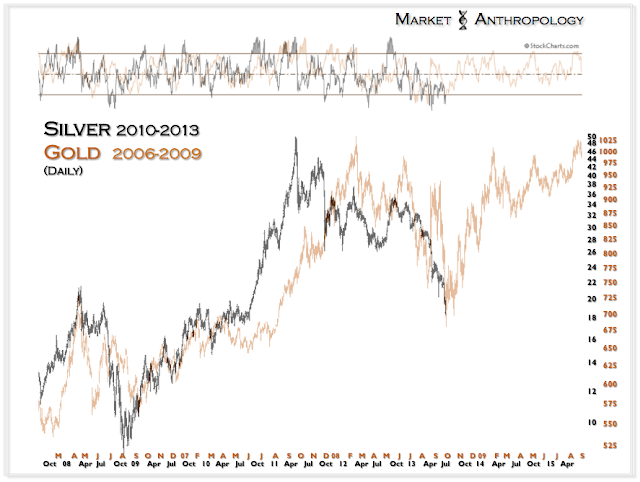 Over the past two years we have read countless research reports, both from technical and fundamental perspectives, advocating positions in the precious metals sector - specifically, their underperforming miners. 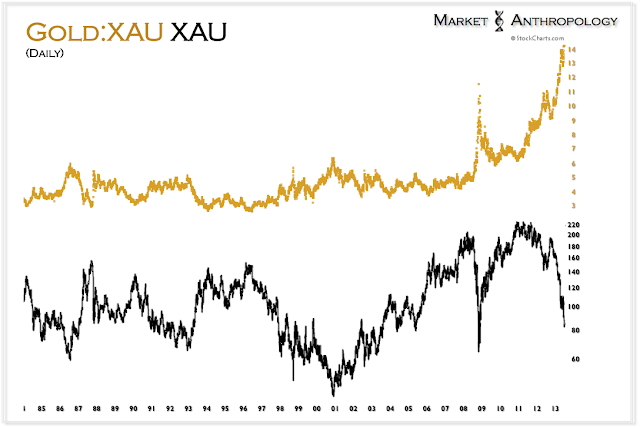 Just last December, when the XAU gold and silver index and corresponding ETF's such as GDX were twice what they currently fetch, they were heralded as great value plays by the media darlings and fast money crowd eager to catch the next wave. Thankfully, we took a less than favorable opinion on them as well as their denominating backdrops and rightfully saw them as the enormous value traps (see Here) they quickly became this past year. 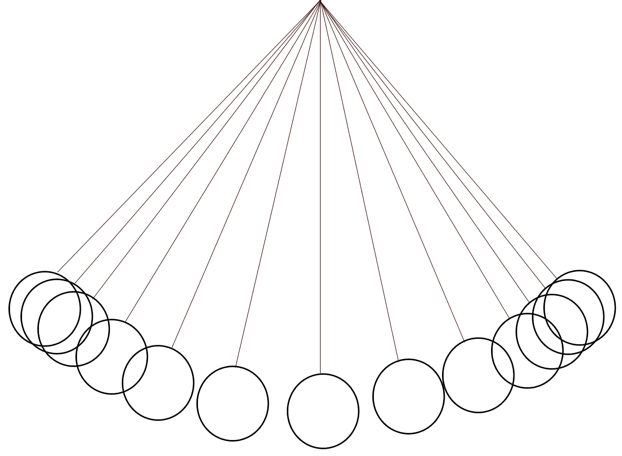 Today, as the sentiment pendulum within the sector has accelerated with great inertia towards the depressive side of the continuum, those same advocates who recommended positions at less than favorable valuations and vulnerable technical underpinnings have suffered such emotional and monetary duress, that they simply don't want any part of them and see further weakness on the horizon. If it wasn't so predictably tragic - it would almost be funny. While we recognize our opinion and posture for the sector has pivoted before the prevailing winds have materially shifted (see Here), this is typically the case for us - considering our process tends to be proactive towards major pivots and our timeframes old fashioned. For us, timing is a relative phrase as buying and selling into market extremes is one of the few occasions where dexterity doesn't count for much - assuming you are positioned on the right side of the tracks and are not day trading. While we can appreciate a quick intraday trade as much as the next guy, we've always found our most profitable ideas have horizons a bit longer than the average news cycle. 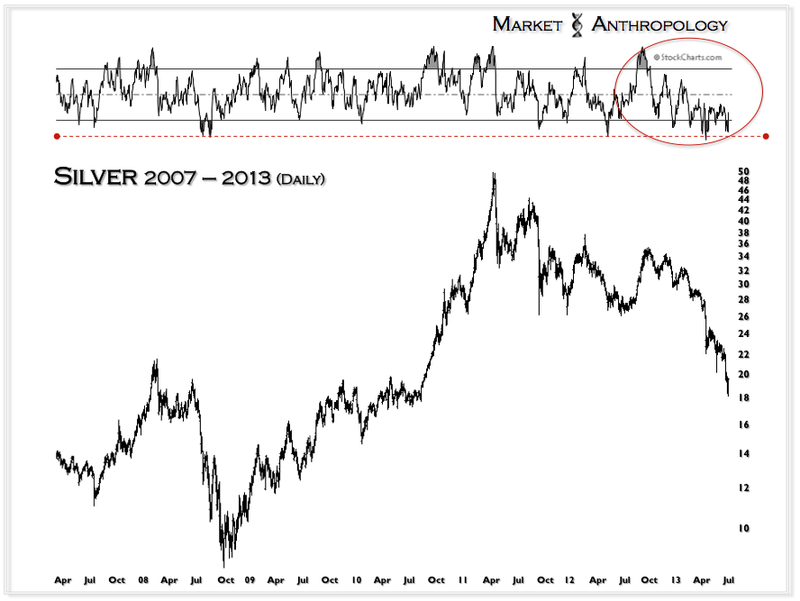 This was the case for us in April of 2011 with silver's blatant parabolic top, and believe the same execution methodology and perspective will work on the dark side of exhaustion with a clear waterfall structure now in place. 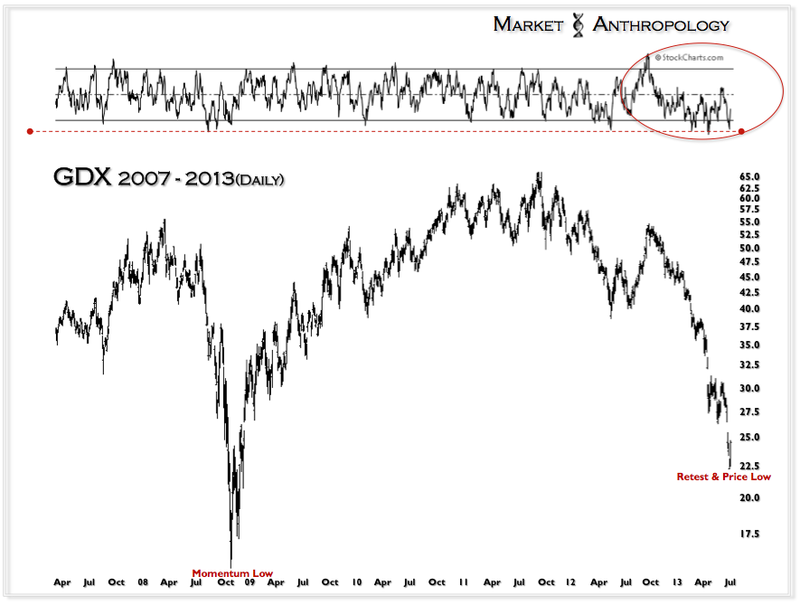 Keeping it simple - sell euphoria and buy hysteria. Certainly easier said than done, but if you step back from the emotional undercurrents that have drowned countless participants over the past two years, the structures left behind in the charts are all too obvious. Moving further down the road to the bear den we once inhabited, we see that the Nouriel Roubini's of world are likely following the same fallacies they applied towards downside targets in the equity markets in 2009, in extrapolating the culmination and capitulation of positions in precious metals - likely at or near the bottom. 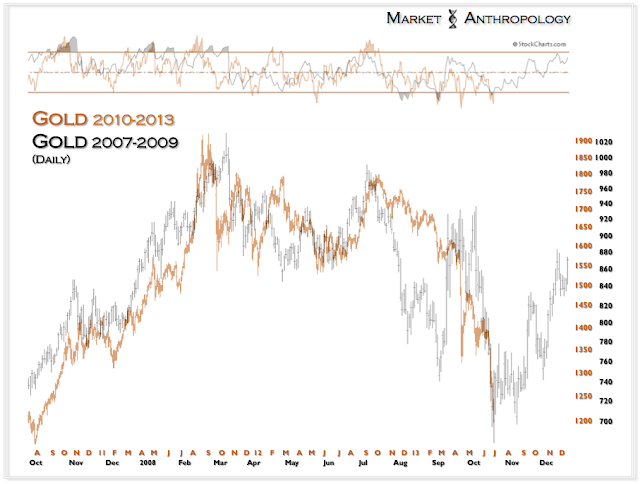 Far from absurd, we can recognize aspects of their logic in seeing spot prices significantly below where they currently reside. 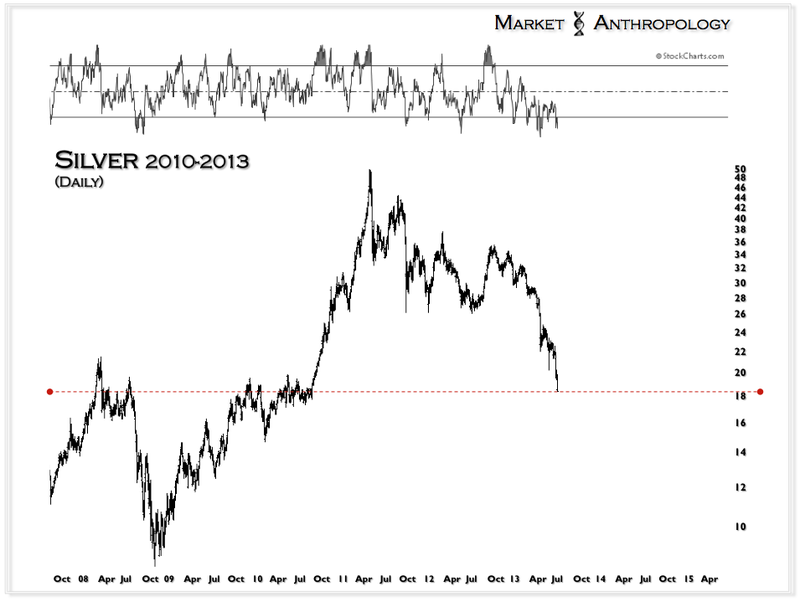 As example, we had up until recently expected the bear market in metals to extend far into 2014. 1. 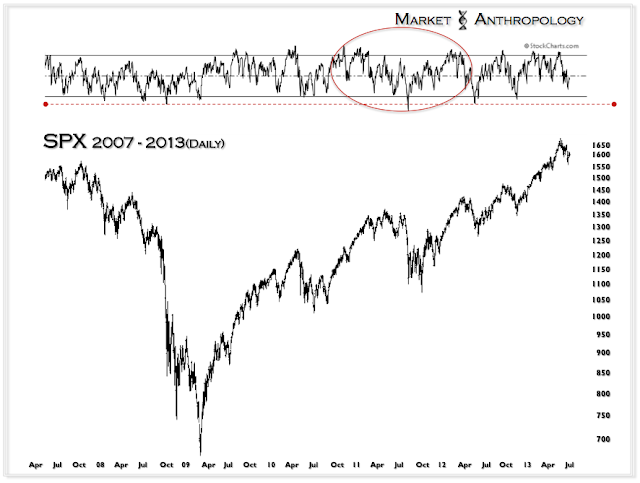 Market structure and momentum went from a gradual and erosive decline - to a full waterfall cascade. 2. Ratio expressions for the sector have extended beyond historical extremes. 3. Both the currency and interest rate backdrops have shifted. B. Interest rates have spiked - relieving yield differentials unfavorably impacting the sector. 4. 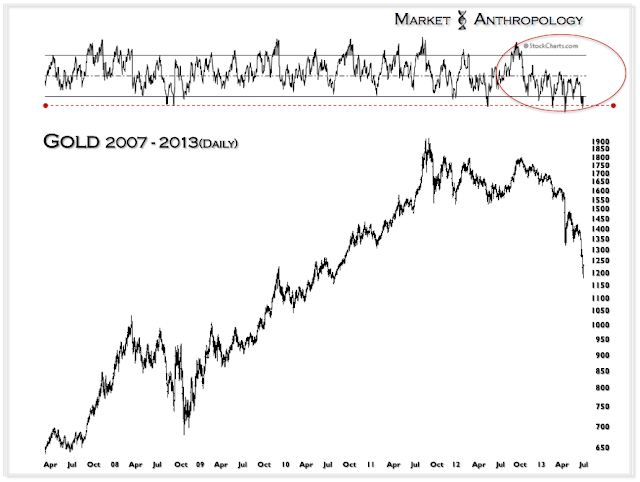 Anecdotal evidence of prominent gold bulls capitulating and despondent conditions within the sector. As evident below, the value trap comparative that we have worked with this year for guidance as to how far the miners could fall relative to gold has fulfilled its proportional equivalent with the banks "generational low", circa 2009. 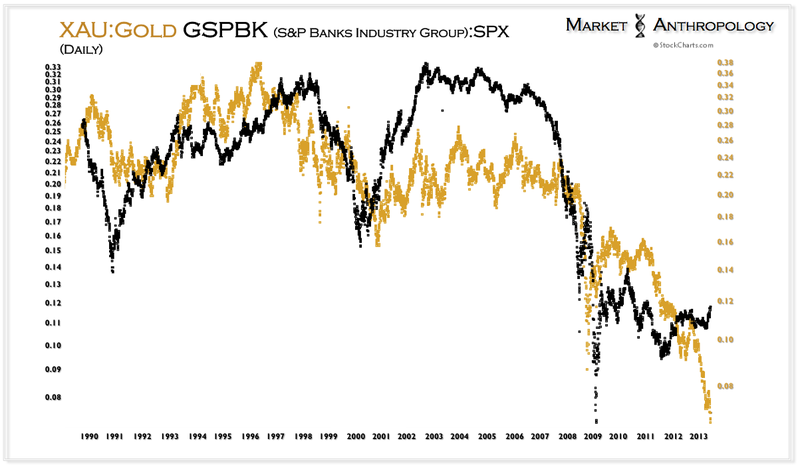 Outside of the comparative, the correlation relationship with the banks is following the previous cycle pivot in 2000, where the banks relative to the SPX washed out before the miners relative to gold bottomed. 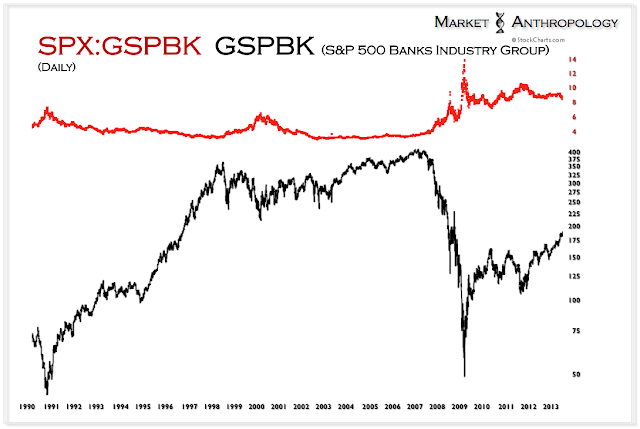 Despite marching to different rhythms, it has paid very well to buy both the banks and the miners when their respective ratio expressions (now flipped) have reached parabolic extremes. As noted in the first series, they have proportionally exhausted along similar lines. 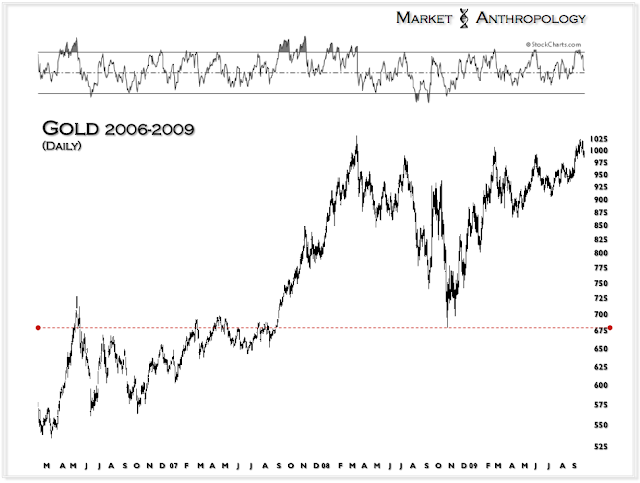 What is particularly interesting is the miners are completing the same exhaustion parallel that the banks navigated in the first half of 2009 - despite putting in a higher high and higher low. It had always bothered us while we were negative and short the sector that the miners had never strongly outperformed spot prices during the span of the entire bull market. 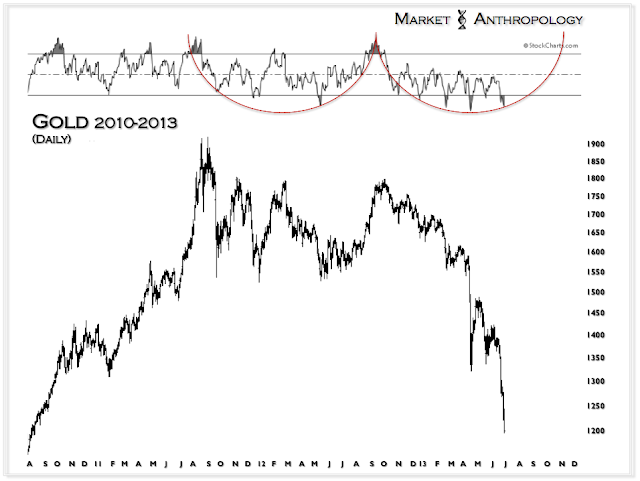 Historically speaking - it was a rather large outlier. While outlandish as it seems right now - perhaps their best days are yet to come. Considering the write downs and efficiencies now dictated by current market conditions - lean and mean for the next leg higher just may provide those conditions. Back in 2011, a similar market and sentiment environment was spawned in the financial sector as the banks careened lower and tested participants moxie in the shadow of the financial crisis. As we recall, the general sentiment at the time - both within the trading and the pundit class, turned overtly bearish on the banks just as they were completing their cycle lows. The thought of buying Bank of America and Citigroup for anything more than a quick trade was seen as reckless and foolish by analysts and pundits so keen on extrapolating current market conditions forward. 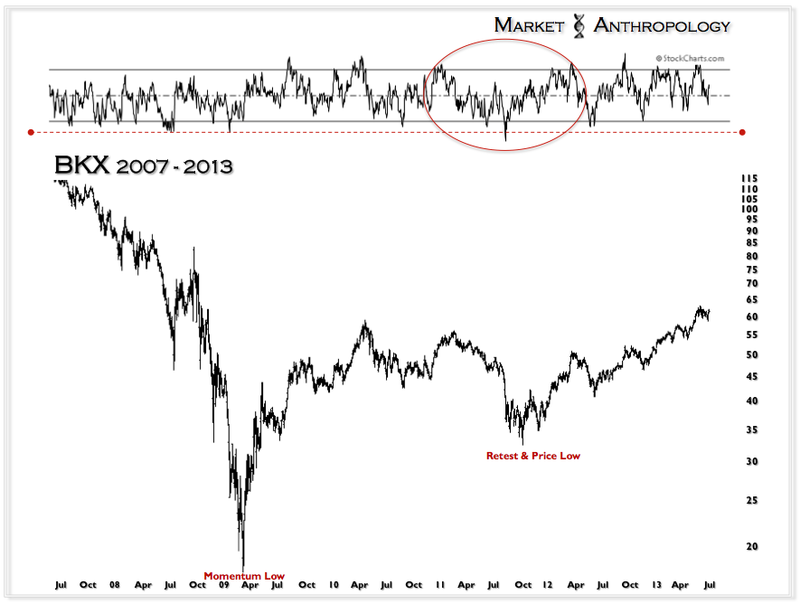 From a purely psychological perspective, the retest is often as difficult to navigate and appraise as the initial crisis itself - due to the long tails of the recency effect. 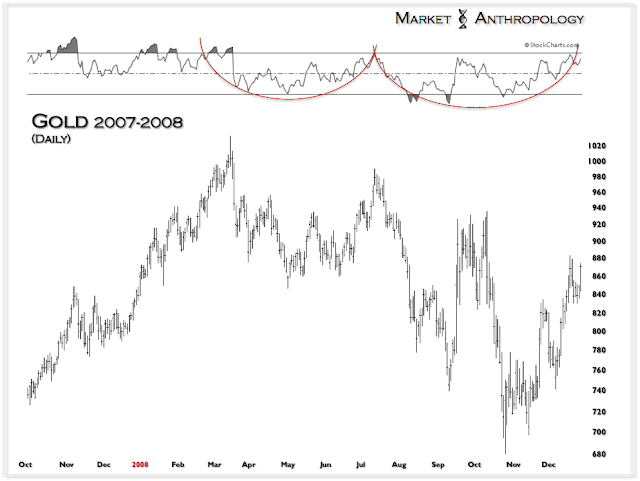 In terms of market structure and momentum, the parallels are evident in the symmetrical and positive divergent nature of their RSI fingerprints and the deeper imprints they recorded versus even during the crisis lows in 2009. 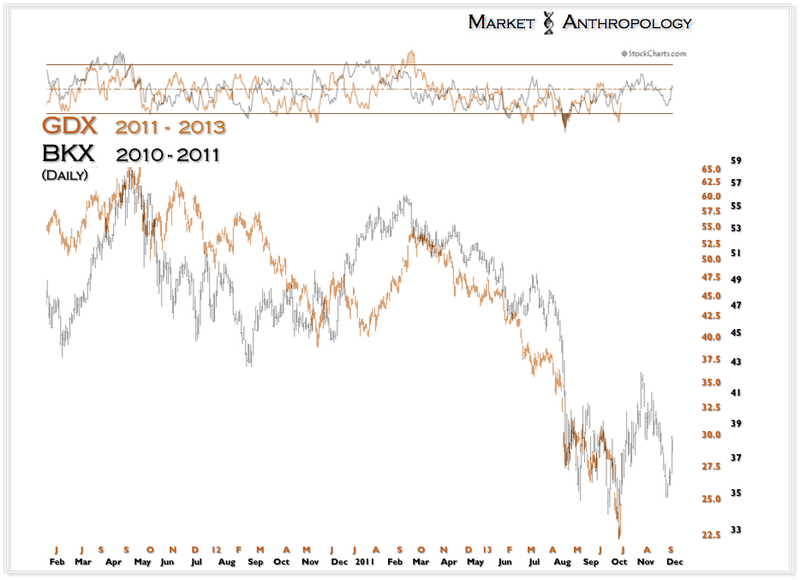 For the broad equity indexes, the cascade in 2011 marked a complete retracement of gains recorded in QE2. Similar to the equity indexes in 2011, gold and silver have now retraced all of their gains recorded subsequent to QE2. Like the financials in 2011, the more emotionally traded miners have exhibited disproportional losses to their denominating asset class. Our expectations - and similar to the financials circa October 2011, is once the retest is successfully completed, the miners will once again lead the sector higher.